The Allstate Foundation’s Purple Purse Campaign!! October is Domestic Violence Awareness month and here in the United States, domestic violence occurs 145 times every hour. That’s why the Allstate Foundation’s Purple Purse Campaign is devoted to uniting friends, families, and communities in the battle against domestic violence. Their goal is to raise awareness of domestic abuse and educate young women regarding the role finances play in helping survivors break free from violence. In its third year, the Allstate Foundation’s Purple Purse Campaign has pledged to raise $350,000 for the YWCA for programs that help domestic violence survivors gain the resources and financial knowledge needed to live independently. The purple purse is a symbol of financial empowerment of domestic violence survivors. This year, more than a thousand purple purses will be filled with domestic violence information that will be distributed throughout the United States. The purple purses include conversation starters, ways to spot signs of abuse and ways to take steps towards financial independence. Their main objective is that each purse will be passed along between friends, family, celebrities, and community leaders which will educate the public about the issue. 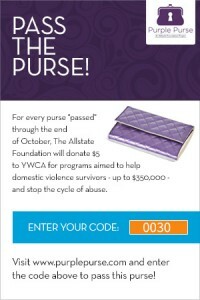 The Allstate foundation will donate $5 each time a purse is checked in at PurplePurse.com. In addition, every time a virtual purple purse is shared at Facebook.com/Purple Purse ,the Allstate foundation will donate $5 to the YWCA. PurplePurse.com is a safe place to learn more about domestic violence and also provides the steps an individual should take if you or somebody you know has become a victim of domestic abuse. This October for Domestic Violence Awareness month let us unite and show our strength in numbers by participating in the Allstate Campaign’s Purple Purse Foundation. As of today, October 3rd, 2013 at 5:35 PM (Eastern time), PurplePurse.com has already donated $167,890 to the YWCA. We’re almost half way to the goal!! With your help and the help of your loved ones we will exceed our financial goal in aiding domestic violence survivors by providing the tools they need to live independently. If you or somebody you know is in need of immediate assistance, call the National Domestic Violence Hotline at 1-800-799 SAFE (7233).